"Schrauben Set für Ventildeckel, 1/4″-20 x 0,515″, zwölfkant, 5 Stück"
Underhead Length (in): 0.515 in. 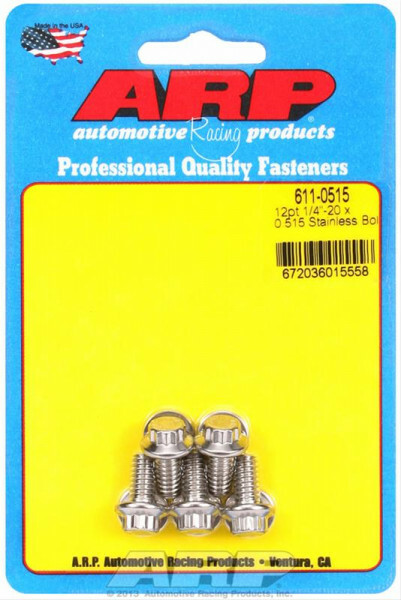 These gorgeous stainless steel bolts from ARP are rated at 170,000 psi to provide a substantial extra margin of safety over Grade 8 and other hardware. They are available in hex head or 12-point styles and a variety of lengths and sizes for use on cars, boats, and trailers. Stock up on these truly maintenance-free bolts so you'll have them when the need arises.